In keeping with the key aims of "creation," "trust," and "cooperation" of our contract manufacturing services, we aim to provide high-quality products and rapid and reliable technology to pharmaceutical companies in Japan and abroad. Where necessary, we can prepare various application dossiers according to CTD, chemical substances control law, and rule for new chemical compound application based on the Labor Safety and Sanitation Law. We undertake tracing experiments, improvement for manufacturing method, and optimization of process parameters. Where necessary, the customer is consulted regarding the improvement policy and the manufacturing method. Any cost estimations can be submitted depending upon the customer requirement, based on theoretical calculations and calculations based on the laboratory investigation results. 75–9000 L reactors, cryogenic reactors, high-temperature reactors, and other special equipment in various manufacturing scales can be used from pilot-scale trial to cGMP commercial production. By combining various technologies for API manufacture, SD, and dosage form design, we devise a drug intermediate with additional functions to API. 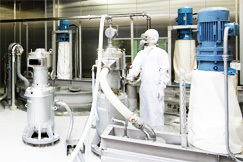 Depending upon powder, capsule, or suppository form of the drug, the production area conforms to the clean room standards (Class 10,000–300,000). Further, we also handle mount seal packaging that is patient-friendly. Since 1981, Fuji Chemical has successfully passed FDA inspections 7 times and gained high cGMP ratings from customers. With an aim to establish a reliable assurance system, the quality department at Fuji Chemical adheres to an established cGMP control system. In order to ensure efficacy and safety of new investigational drugs and pharmaceutical drugs, we perform strict testing in compliance with cGMP, from raw material acceptance to in-process control and product release testing.